If you're like us, your dogs have become family members. When you can't be home for them either because of work, holiday or other obligations, you want them taken care of with the same love and attention you give them. That's exactly what we do at Heartland Kennels. Because we love dogs! Heartland Kennels offers a unique dog-sitting service. Your dogs will arrive and become part of our family. They will share the house & garden with our own dogs and will benefit from socialization and daily runs. Your dog will sleep, eat and play with our own dogs....the only problems are that our visitors are sometimes reluctant to go home. 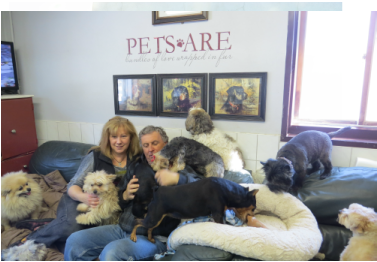 To always ensure the best possible comfort for the dogs in our care, Heartland's facility is temperature controlled with air conditioning and heating and we also have a backup Generac system.